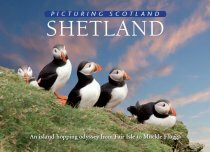 This book is set out in the form of a guided tour around the Shetland Isles, beginning in the south and working northwards. On the way, it takes in many islands and the more remote areas of Shetland's Mainland. The isles of Mousa, Burra, Bressay, Noss, Foula, Papa Stour, Whalsay, Yell, Fetlar, Unst and Muckle Flugga all show off their differing characters and unique charms. Along the way, many of Shetland's birds and animals make an appearance, from ponies to puffins and sheep to skuas. The book contains a total of 113 pictures.